Participants are transported with their equipment and helmets in groups of up to 8 people in our 4×4 vehicle to the departure platform. When they reach the end of the zip line in Portugal, participants have to walk for about 5 minutes to the Alcoutim jetty where they are ferried back across the river to Spain, with the cost of the ferry being included in the price. 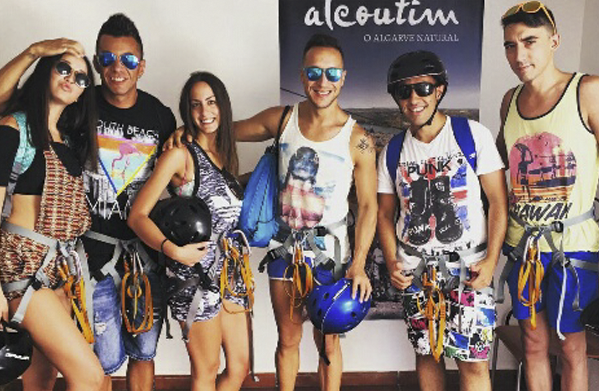 There is no time limit for visiting Alcoutim. Clients must make sure they have at least 40 minutes for this unique experience. LIMITEZERO reserves the right to change these limits depending on the weather conditions. LIMITEZERO is able to provide these experience for people with different types of disabilities, giving the relevant recommendations in each individual case with this situation being reported in advance.